We are a leading Manufacturer of cvc nt-rust, dry film rust preventive, non-drying oily rust preventive, strippable rust preventive coating and pvc tefkote-33 dry lubricant from Mumbai, India. Rust Preventive or NT-Rust (WX) is a petroleum based rust preventive which forms a soft waxy film over the metal surface. It is used for protection of exposed gear boxes, internal gear boxes, steel sheets during transportation, structural,hydraulic systems, I.C.engines and molds of plastic components etc. The waxy film can be removed easily by wiping or with the help of solvents. This product is available in any other colors such as Blue, Green, Red etc. for bulk requirement. Dry Film Rust Preventive also commonly known as CVC NT-Rust (DF) is a light-bodied pale colored consisting of high molecular weight resin with Rust Inhibiting additives in a solvent base. The solvent will evaporate from the coated parts leaving a thin transparent film, which is shiny in appearance and non-brittle. This is a flexible film and is suitable for protection of metal parts exposed to the atmospheric rust at moderate temperatures under mild acidic and alkaline conditions. 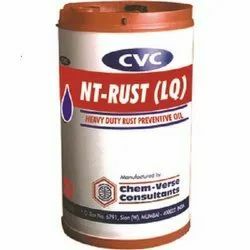 Non-Drying Oily Rust Preventive also known as CVC NT-Rust(LQ) is a petroleum based rust preventive which forms a soft oily film over the metal surface. It is used for protection of exposed gear boxes,internal gear boxes, steel sheets during transportation, hydraulic systems I.C. engines etc. The oil film can be removed easily by wiping or with the help of solvents. CVC STRIPKOTE is based on a polymeric substance dispersed in wetting agents, organic solvents, film leveling agents, dryers and plasticizes for attaining mechanical strength to the film. It leaves a very thin rust protective coating dried film on the surface which will be non permeable to water, acids, alkalies and to any atmospheric attack. The film will offer excellent protection against atmospheric corrosion for a period of 12 months indoors & for a period of 6 months outdoors, while the components are stored in a covered shed. This rust preventive coating can be easily removed by peeling it off like a banana skin when not required. It can be used as supplied without any dilution for brushing application. Protects from rust &corrosion without affecting the surface. 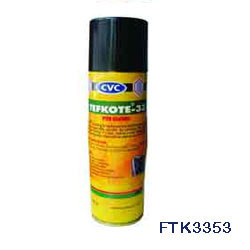 TEFKOTE-33 Dry Lubricant is an aerosol dispersion of a dry fluorocarbon resin. It is designed for use wherever a dry, non-oily lubricant is required. The dry coating provides a low co-efficient of friction which gives excellent lubrication and release properties. TEFKOTE-33 Dry Lubricant can be used on wood, metal and most plastics when not under stress. It is a clean, non-staining aerosol spray that dries on contact, with no oily residue. This makes it ideal around the house for sliding doors and traverse rods, electrical equipment, at play for sports equipment and well suited for fine furniture keeping bulky drawers sliding freely piano parts etc. Surfaces coated with "TEFKOTE-33" lubricant are antiwetting. Coverage ... 10-12 Sq. cm/gm.